When I had been married for 18 years, I was accepted into a university program that was number one in the nation in its field , and I went back to a school 30 miles away to finish my undergraduate degree, which I had put off two times. Around the same time, my husband decided to take a job 250 miles away from where we lived - in a place I didn't want to go - so we sold our apartment - and after seven long-distance moves together, he moved away and, instead of commuting, I took a "flat" in the basement of someone's house near the campus. Over the next three years, I added only two cookbooks to my collection. I discovered the first one in the very small book section of a major department store near school. There were two copies of this book there, and I eyed and drooled over it for seven months before summer came when I had a job and felt I could spring for it. 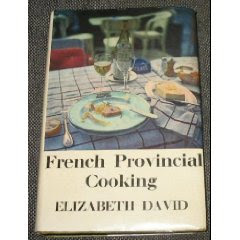 A hardback copy of Elizabeth David's French Provincial Cooking . 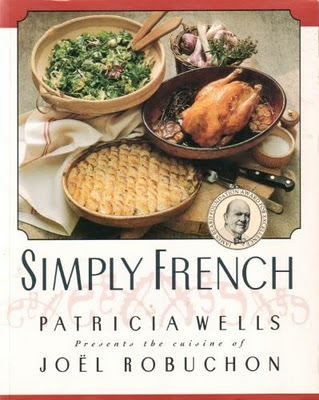 This is a wonderful book; probably the seminal book on "French Provincial" cooking. Alice Waters apparently got her inspiration from Elizabeth David, and Laurie Colwin loved her (along with Edna Lewis and the many contributors to Charleston Receipts ). I learned to make Elizabeth David's chocolate souffle with one hand tied behind my back (just kidding). But, no joke, I have enthralled many diners with that delicious recipe, which I gild by pouring chocolate sauce into then topping with loosely whipped cream. That same summer - because it was the only summer I had off since the program I was in went straight through the year from then on - I stayed in my friend's apartment in New York City and commuted by train to Greenwich, Connecticut, to work. Every day I would pass a store-front that housed a catering business, and there were always a few cookbooks lying around on a window-seat, which I could see as I walked by. There was one book that was there more than most. So one day I walked inside to ask about it. The women I spoke with gave me a knowing nod and said, "Oh, yes. This is a wonderful book. A MOST wonderful book. But people don't know it. Why do you ask about it?" I explained that I had just seen it there and was curious, and at the end of the day when I got off the Number 6 train at Lexington Avenue, I darted into Barne's & Noble. Sure enough, one copy of the book was there. I couldn't afford it then, but after years of buying pretty much whatever I wanted (within reason), I saved up, and by the end of the summer, the book was mine. This is an amazing book, which introduced me to Patricia Wells AND Joel Robuchon. From this book I learned that pureed potatoes are completely different from mashed potatoes. That pureed potatoes are ethereal. They are the star of the meal, not the side. They are what the best food you eat is all about. This is an adaptation of those potatoes, but, trust me - some of you know me well enough by now - these are the best pureed - not mashed - potatoes you will ever eat. I can't really give you amounts; it will depend on how many people you are serving. A tamis is a sieve. Mine is a beautiful stainless steel tamis that I got at E. Dehilleran in Paris. You can push the potatoes through another strainer, and it will work well, but if you ever go to Paris, PLEASE add E. Dehillerin to your list of places you must go. And go there first. Peel your potatoes, and cut them into chunks. (They are not all cut in this picture.) Halve or quarter them depending on the size of the potato. Steam them (I use a basket steamer) until you can pierce them with a cake tester. Heat some heavy cream - for 2 to 4 people it's usually a 1/2 pint - in a little pan on the stove or in the microwave. Slowly add the heated cream to the riced or milled potatoes, beating the potatoes with a hand-held electric mixer. Don't be stingy. Be more than generous with the cream. When finished, these potatoes should "spread" out on the plate. Add a little fine sea salt to taste. I don't add much, and I don't add pepper - black or white. I keep unsalted butter in my larder; however, Clotilde mentioned in her post about the delicious Piege Cake that she uses salted butter. If that's what you use, it will, obviously, affect the amount of salt you add. or - if you don't have one - through a sieve into a heat-proof bowl. Before serving, if necessary, heat the potatoes in the microwave for 3 minutes or over a double boiler for about 10 minutes until they are warm, then serve with whatever sounds good. Don't be shy about heating leftovers in the microwave. They aren't as good as freshly made, but they are still a treat. This is with Barbecue Brisket. It was made with heavy cream AND butter. These pureed potatoes go with a myriad of dishes through the seasons. You are only limited by what sounds good to you. Do you prefer the ricer or the food mill? The food mill looks like it work work better for messy-types, (cough). And I love that you stalk books, (or is that past tense?, nah, once a book-stalker, always a book stalker, I guess). I stalk books. Cookbooks of course. So if you only want one, go for the food mill. In either case, however, the Oxo version of the product is great - easy to use, functional, and a snap to clean. Nice writeup and an interesting variation on potato puree. Interesting that you use more cream and only optionally add butter, and Robuchon's original version calls for LOTS of butter (a 2:1 potato/butter ratio), and milk or cream only if necessary.